East Valley Martial Arts has a terrific, well developed Little Dragons program. Our youngest students are three, four and five years old. In Little Dragons we focus on listening, paying attention and following directions. Students are taught responsibility, and challenged to do their best with plenty of positive encouragement. It is rare to find a traditional martial arts school that teaches three-year-olds. When you find an instructor who teaches young children well, you know that instructor has patience, which will carry over into their other programs. Jenifer Tull-Gauger Renshi and Kirk Gauger Renshi have been teaching karate to this age group for nearly two decades. They continue to make this program available because of the improvements they have seen in Little Dragons students in listening skills, self-confidence, respect and social skills. With the youngest students we work on learning how to learn. We help them to focus, follow directions and treat others with respect. The activities in class are based on our traditional Okinawan karate program and they improve coordination, discipline, life protection and physical skills. If your child is at least three years old, potty trained, and able to communicate with an instructor, we recommend giving it a try! Some preschool aged kids may act shy or be very hesitant to join their first class. 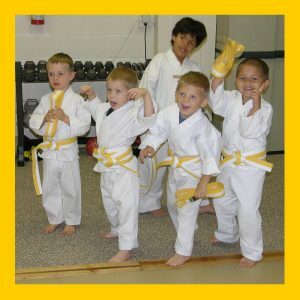 If this is the case with your child, we recommend that you bring them by just to meet us and to watch Little Dragons classes until your child feels more comfortable with the instructors, other kids, and dojo surroundings. HOW OFTEN SHOULD MY CHILD ATTEND? We recommend attending two Little Dragons classes per week consistently to keep your child moving forward and for retention of the material. HOW DO YOU KEEP THEM MOTIVATED? We give plenty of positive encouragement for their effort, plus tickets for a great job in class (they get a prize for bringing back 10 tickets). They earn stripes on their belt, about every two weeks, as they progress, and stickers for special encouragement. Young children do best when parents watch class regularly and reinforce the values taught. You can also encourage your children to do their best and practice at home. Helping them get ready and get to class on time is great too. There is a $50 registration fee due with first payment, and it’s only $105 per month thereafter for the Little Dragons Program. We also offer a family member rate at $90 per month. * Registration fees are reassessed after any lapse in membership. HOW DO LITTLE DRAGONS ADVANCE? The Little Dragons curriculum is based on the requirements for older students, but we take it slow and steady, while working on the needs of the younger child. With regular attendance, a Little Dragons student should test for a new belt approximately every two months. The belt system includes tri-step belts, based on the traditional belts with two additional belts between each kyu rank. This will allow the Little Dragons to see and feel their advancement as well as smoothly transition to the Kids Program when old enough. The test fee is $20 for each test taken while in the Little Dragons program. CAN MY CHILD GO TO CLASS WITH THE OLDER KIDS? Not while in the Little Dragons Program. Occasionally we will approve a five-year-old for the Kids Program, which is more intensive, geared to older children, and has higher dues. Around the time your child starts first grade and/or turns six years old, we will start considering your child for the Kids Program. Once that transition is made, we will make an adjustment in dues and open up the Kids Program class schedule to your child. Additionally, our Kids Program is geared to children ages six through twelve. Click here to learn more about our Kids Program. Call now to learn more about our Little Dragons Program!